14 pp. Roman, 241 pp. This study functions as a discourse oriented basic grammar of Jeli, a language belonging to Western Mande and affiliated to the group of Ligbi languages (Jogo, Numu, Hwela). Jeli is spoken by approx. 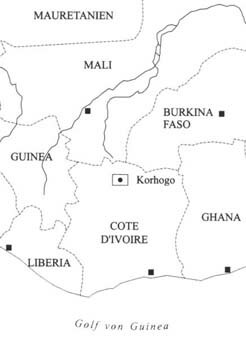 2,000 speakers around Korhogo, Côte d’Ivoire. Because of the dominance of Senufo and Jula in this area Jeli is considered to be an highly endangered language. 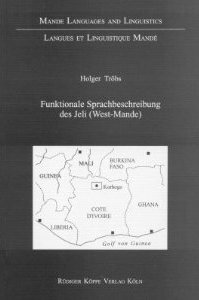 The first chapter gives an anthropological sketch of the Jeli, and offers arguments about their geographical origin and historical migrations gained by a comparison of the Jeli’s own oral migration history with the results of the linguistic analysis. The following linguistic part describes the phonemic system and the categorisation of word classes using formal criteria, before broadening the focus by a comparison with semantic and pragmatic parameters. Emphasis is then placed on the analysis of modal, aspect and tense systems and the structure of syntagma, nominal and verbal predicatives. The results are then applied to the field of narrative discourse by describing the macrostructure of Jeli fairy tales. This documentation of Jeli uses the latest advancements in the fields of typology and grammaticalisation. Thus the study serves to broaden the empirical basis for the typological characterisation of the Western Mande languages. [...] Tröbs’ Buch [ist] ein wichtiger Beitrag zur Erforschung der Mande-Sprachen. Er ist umso bedeutender, als es sich bei dem Jeli um eine Sprache handelt, deren Sprecher ihre Sprache immer mehr zugunsten des Dyula oder des Senari aufgeben.